Hello and happy hump day! 4 day weeks are the best because it’s always a day later than it should be (assuming it’s Monday we have off). Exciting stuff. Last week, I set 4 goals for the week and they went REALLY well! I’m happy that I got in varied exercise with several runs, some strength training, yoga, and biking! 2.) Get in a long run. Check! On Saturday, I ran 10.7 miles, which is my longest run EVER. 3.) Cook every single meal this week. Check! I am very proud to report that I cooked every single meal at home for breakfast, lunch, and dinner, except for my dinner out on Sunday night which was a special occasion (sort of). It was a bit tough resisting ordering in or going to happy hour, but it forced me to be creative in the kitchen and I came up with several new recipes, including 4 Ingredient Breakfast Casserole, Breakfast Couscous, Easy Baked Tofu, and one below! I hadn’t shared new recipes with you guys in a while so that was definitely a great thing! 4.) Drink More Water. Check! I drank 2+ bottles of water at work every day, plus more at night and during exercise. Since those goals went so well, I’m going to set some new goals for the next week. 1.) Keep up with 5x of exercise a week, including a 12 mile run this weekend. 2.) Try to count points every day, even if I go over. This is good because it forces me to pay attention to portion sizes, plus I think it’s helpful for those following Weight Watchers to see my daily points breakdown to get some meal ideas. 3.) Keep up cooking at home as much as possible. 4.) Plan for one treat a day. I think planning for a small splurge helps me keep on track. Perhaps I won’t eat chocolate peanut butter for dinner if I do this. And now, for a new, easy recipe! 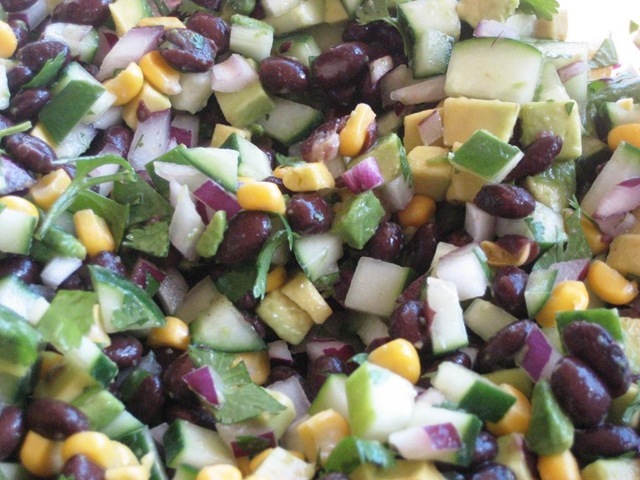 – Combine first 4 ingredients (cucumber, onion, black beans, corn) and mix thoroughly. What are some of your goals for this week? Do you find you’re held more accountable when you write them down? Way to go on your run this week! Isn’t it a great feeling to conquer a distance you haven’t done before?! I really like your idea of setting weekly goals – seems more manageable than a month long set of goals. That salad is so fresh and colorful! Because of marathon training, my workout goals are pretty much laid out for me, but I love going into the week with a plan! I’m stealing that recipe this week! Writing down (or blogging) goals has definitely helped me stay accountable. Yes I love to make goals for the week: It keeps me focused and on track. I especially have to schedule my workouts! 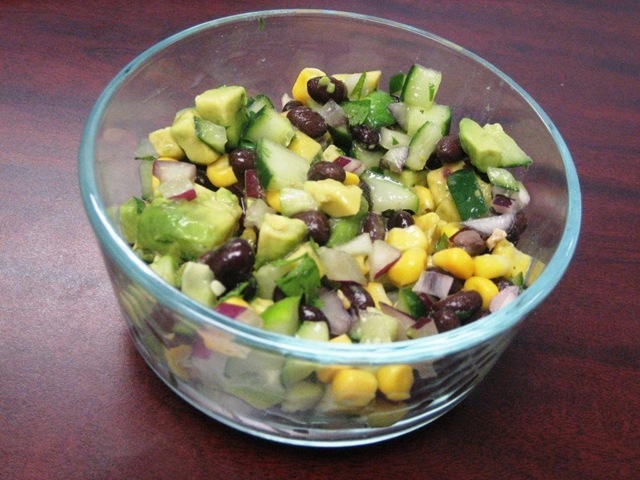 I love that corn/black bean salad. It looks delicious! Looks great – I have just recently fallen in love with fresh cilantro, so fresh! Congrats reaching all of those goals this week – that’s awesome! I do monthly goals and sometimes weekly ones. congrats on cooking homemade meals for breakfast lunch and dinner! that would definitely be hard for me but a challenge like that would be great! making and creating yummy-healthy salads comes so naturally for you! a quick lime marinade with some salt and pepper sounds great!! way to go on your long run!! always exciting to hit those new milestones. one of my goals for the month was to incorporate the bf into meal planning and cooking. one easy conversation took care of that! and i agree. one “scheduled” treat a day prevents me from chowing down on a bunch at one time.